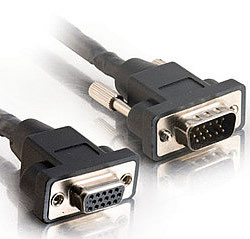 This is a SXGA cable and provides a screen resolution of 1280 x 1024 pixels. Provide access to a PC, monitor, or projector with minimal exposure or repositioning. From connections at podiums and kiosks to wall plate mounting, our panel-mount cable is a great way to keep your connections clean and professional. Featuring screw-style connectors with a molded hood, this cable provides an easy connection to a faceplate or machined port. These cables also come in the Plenum version click here.